One of the things we love about the boys having soccer games around Tuscany, is that it forces us to rent cars and get better acquainted with Italy. Even while staying in Florence, there are times that we just feel like curling up and contributing to the concept of home-bodies. But alas games are scheduled and inevitably we rent a car, make plans and end up with more photos, stories and experiences. Even if it is cold and rainy and mishaps occur... we still never regret getting out and about. This Sunday Anthony had a game just outside of Montepulciano. (I say this simply, but in reality stating the location of a game involves renting a car, retrieving the car via bike, phone calls in Italian, meeting up with team, going to the wrong field, depending on GPS, forgetting umbrellas, secretly venerating REI for selling Smartwool socks and undergarments, finding nearby espresso... and watching good soccer). This past Sunday was bone-chilling cold, and impressively foggy. Which... keeps most wise tourists away. Actually, the cold and time of year means we often have tourist-laden cities to ourselves. 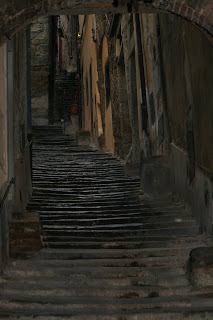 Our visit to Cortona was nearly uncanny. It was so foggy, devoid people milling about, many shops were closed and parking was easy. We still got a great sense of the city, found soul-warming coffee and enjoyed a fabulous, cozy lunch. We visited one of the churches, found ceramic shops and walked up and down a number of streets. We saw about a third of the city, and hope to return again someday. Greve in Chianti is a treat. It is the icon city of the Chianti Classico region of Tuscany (Chianti has 8 different regions, and the Chianti Classico region is the best-known, not only because they have fabulously marketed their wines, but they are the only region allowed to boast that fabulous black rooster motif). And Greve is tourist-ready: full of impressive shops, piled with souvenirs of the Chianti region, a world-class butcher shop (macellaria) and a line-up of restaurants worthy of a visit. We arrived a bit late to the city, but had just enough time to poke into the butcher, peek into some wine and clothing shops and get a sense of the city. Oh, and did I mention we almost ran into a small group of wild boar? My favorite new animal to eat and adore are cinghiale. Our new family favorite animal is easily the infamous, Tuscan wild boar. They make the best salami, prosciutto, sausage, ragu, sauce... and entertainment. It was awesome to see 4 of them jet across the road in front of our little car. With each of your posts, I just want to come to Italy immediately and take in everything you have so beautifully described. It seems even better to not have so many tourists to deal with. Love the colorful photo of the soccer players! Again, thank you for sharing this fabulous adventure with the rest of us. Barb: aw, I hope it sounds good. Our adventures sure are full of good and all the rest;). I am becoming a big fan of traveling during non-tourist seasons!